Privacy is still a hot topic when it comes to Microsoft's Windows 10 operating system. While things seem to have cooled down a bit, there are still lots of users out there who don't want to use Windows 10 because of privacy concerns. Microsoft revealed some details on the collecting of Telemetry data back in April, and seems to have opened up a bit more as it released information on Telemetry in April 2017. Update: We have published a review of the 2018 version of WPD here. WPD is a portable program that you can run from any location; it requires no installation. The program displays its four main sections privacy, firewall, apps and tweaker on start. The program uses a simple slider system when it comes to most settings. A blue slider indicates that a setting or feature is enabled, a white one that it is disabled and not available. The privacy group of tweaks is divided into Group Policy, Services, and Scheduler switches. Each option has a question mark icon next to it which you can activate with a mouse click to display a short description of what it is and what it does. While that may not be necessary for some of the tweaks, Telemetry or Advertising ID for instance, it may be helpful for other features. It may be unclear for instance what Throttle additional data or Consolidator do; most descriptions make it clearer. There are some that require a bit more work though (Compatibility Appraiser just lists a path and file name for instance). You can change features individually, or use the switch all button displayed on the page to make the change for all controls in one operation. Note that some features, Cortana or OneDrive for instance, may stop working if you toggle them off. The second group, Firewall, lets you add IP addresses to the Windows Firewall to block communication with Microsoft servers and third-party apps. The rules are sorted into the three groups Windows telemetry, third-party apps, and Windows Update, and you may enable one or all of them. The IP list is taken from the free program Windows Spy Blocker which is updated regularly. The page indicates whether rules are set, and there is a small icon next to each group that allows you to copy the whole list of IP addresses that the group is made of to the Clipboard. This is useful for reviewing the list before you apply it, and also if you use a different firewall or program to control network traffic. The third group, Uninstall, lists default Windows applications, and provides you with options to delete some or all of them from the program interface. All it takes is to select the apps that you want removed -- 3D Builder or Get Office for instance -- and hit the delete button afterwards. You can also delete all applications in one swift operation. The fourth and final group lists tweaks that you may apply. These are also privacy related for the most part. You may allow or disallow apps to use certain data sets or hardware functions, like the camera, microphone or contacts, here among other things. WPD is a handy program for Windows 10 users who want more control over privacy related settings of the operating system. The program is easy to use and portable. One downside is that it does not create a backup of sorts before changes are made. While you can toggle all features directly in the interface, it is recommended that you create a System Restore point or, better, a full backup of the system partition before you use the application. Now You: Do you run Windows 10? Have you made any privacy related changes? This is only half funny. If you could “Disable All”, Windows 10 itself would disappear. Is the “better” than shutup10? Deals with a lot of things shutup10 doesn’t, best to just open it and see which are enabled/already covered by SU10. Bad enough that third party programs have to try to stop the lunacy MS has created. I considered their products pretty good and reliable but than ignorance and greed took over and ruined it for me. It’s just sad. Nice one, thanks. This slider system is a bit confusing though. For example: “Use OneDrive for file storage”. If I set that to blue/ON, do I enable OneDrive or not? I would think that a blue setting is the more privacy-conscious one (and the reason to use such a program) but in this case, it is quite unclear. Telemetry: a blue/ON setting enables Telemetry or disables it? I hate such spartan, cryptic descriptions. update: confirmed, setting the OneDrive policy option to blue actually enables OneDrive. Author needs to decide what’s the relation between descriptions and on/off status. Setting everything to ON is probably NOT the way to go. Ok, I might have been a bit harsh. Setting everything to OFF is the preferred mode for the Privacy settings. A really nice program, I hope it lives on and gets updated. that the same used by windows ( the thing you’re running on your computer ) and other tweak tools. Does this work on W10 Home installs? Be sure to always use PeerBlock to block IP’s since hosts file and windows firewall block method don’t 100% work because MS can just bypass it. Download the .p2p file and load it in PeerBlock > List Manager > Add. Sounds like an interesting and helpful program. Love Gehacks.net However It would be an improvement If you would include a link to the program..
Software links are always in the summary box below the article. Its ridiculous that we need to jump through so many hoops and still not be guaranteed to be free from some of the unnecessary data leaks. while apps like these are great it doesn’t do much to address the trust that has been broken therefore Windows 10 and every update since will always be brought into question and Microsoft be dogged by the grey cloud over their heads. Absolutely terrible on Microsoft’s behalf but I digress, this is about the software which seems to be reasonable for what it does, the tooltips are nice and help to make an educated decision. I also had to hunt to find a program download link. OK I eventually noticed you said it was in a summary box. OK more time scrolling, but even then it’s described as a “landing page”. God help us surely you can see this is an obscure approach to something very simple. Installed this but unsure how well it might work. I have other software programs that I have used to control Win10 privacy, telemetry and so forth. For instance, “DoNotSpy10” or “Winaero Tweaker”. as an example, I know that I have Cortana disabled and I don’t allow Cortana search. 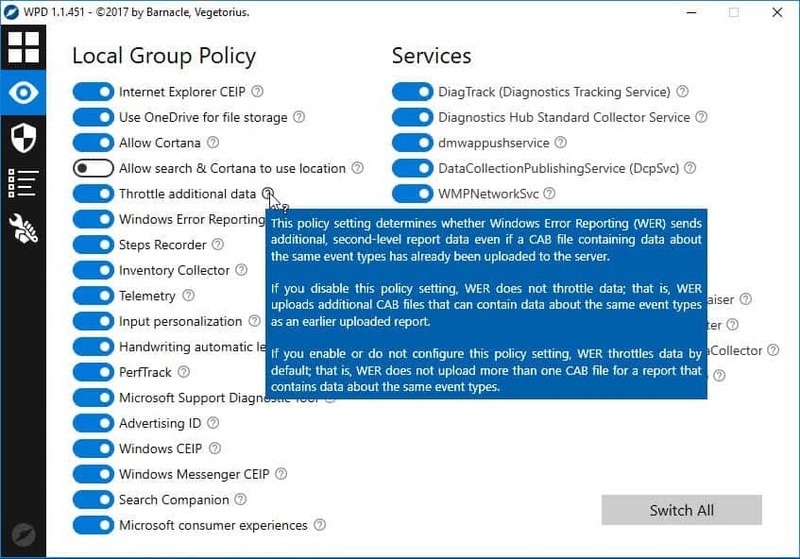 But I see that WPD shows both Cortana options enabled in Local Group Policy (LGP). Is a LGP setting different than registry settings? I cannot find WindowsSpyBlocker in the link of your article. Can you change it ? IMPORTANT REMINDER: Run WPD (or another privacy tool) and check the results every time you have applied Microsoft patches/updates. Even Microsoft’s “security only” patches can re-enable diagnostics and telemetry.